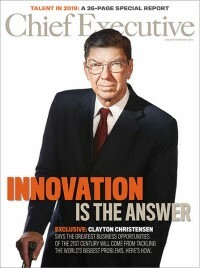 Every CEO knows that innovation is critical to long-term success. But that’s not enough: to have a real business impact, innovation must scale. And innovating with digital technologies at scale is precisely where many businesses are getting stuck. Take one global sportswear manufacturer as an example. It opened a new facility to accelerate production of personalized products at scale using robotics, machine learning and 3D printing. Despite these innovative technologies, however, production couldn’t ramp up fast enough because the company had failed to adapt its operations to support full automation. Due to the resulting financial losses, the facility was eventually closed. This cautionary tale might be enough to make some CEOs think twice about their investments in digital innovation. Doing so puts their company at very real risk of being disrupted by digitally advanced competitors. This is because a growing number of companies are actively looking to scale innovation, and a proportion—albeit small—are succeeding. The figures are actually quite surprising. A recent Accenture research study of 1,350 C-suite and senior executives from global industrial businesses found that they are scaling more than half of all digital innovation proofs of concept (POCs), with a focus on scaling security-, product-, and service-related PoCs, and not only on efficiency-related efforts. This figure suggests that the Fourth Industrial Revolution that’s been talked about for so long is about to reach a tipping point. No organization can afford to take their foot off the accelerator. You may take this observation with a grain of salt if you are the CEO of a business that’s invested heavily in breakthrough technologies but have failed to see a decent return on that investment. However, doing so would be a mistake. Our research shows that businesses who approach the scaling of digital innovation in the right way stand to win big. In fact, we see 22 percent of large businesses in our sample to have found highly effective ways to scale their digital innovations and as a result are realizing significant returns. We call these businesses ‘Champions’. These digital innovation ‘Champions’ enjoy up to four times the return on digital investment compared to their peers – even though they’re struggling with the same challenges. What’s more, these Champions are able to scale more than 50 percent of their innovation pilots. What are these companies doing that others aren’t? And what can CEOs learn from these Champions to apply in their own businesses? In a nutshell the answer is: driving innovation must be designed as a holistic scalable process for delivering business impact. It’s must not be seen as an action that’s just about building a one-off proof-of-concept. And it’s important to note that such transformation is only possible with leadership intervention from the very top of the organization. 1. Define the value that will guide innovation efforts. More so than their peers, Champions consistently define the value they want to capture before they set their organization to the task. By understanding clearly what they want to achieve they know when and how to scale their proof of concepts. Significantly, Champions have input from the most senior levels of the business to ensure that innovations narrow in on the most promising market opportunities. 2. Drive internal organizational change and external digital value. As we saw with the sportwear manufacturer discussed above, when internal change and external ambition are misaligned, innovation doesn’t work. Champions blend organizational change and digital transformation initiatives, ensuring that what’s hoped for externally is deliverable internally. This approach helps develop a learning curve that is agreeable to all in the organization and facilitates greater collaboration and flexibility. 3. Build in-house innovation factories with targeted influence. Integrating innovations based on new technologies along with the associated talent and assets into the larger organization is an enormous challenge. Champions look to overcome this challenge by seeding and growing digital innovations organically within organizational boundaries. They ensure that all innovations are accountable to the company’s profit and losses, so they can preview the effect of scaling a proof of concept on the larger organization before the scaling process begins in earnest. This allows them to integrate the new products, services and ways of innovating into the wider organization as it matures. 4. Find out what enables innovation in each business function. Our research shows that most businesses are using the same enablers to drive innovation – things like software applications to support operations, or analytics platforms to generate better insights, for example. The difference with Champions is that they’re masters at matching the support to the function that needs it most and will use it best. The Champions in our research are pioneers. They have accelerated their way to achieve meaningful innovation at scale. While they are enjoying an early advantage, their successful strategies benefit the entire industry by providing a game plan on how to scale digital proof of concepts. Those that take a page from how Champions operate stand to gain in their journey of innovation.